Specialty Coils has been a certified applicator and distributor of INFINIGARD protective coil coating for a few years now. We have been very impressed with the product and have received amazing feedback from our customers. But now… INFINIGARD is even better! We are happy to announce that we will now be applying INFINIGARD2. The already impressive protective coating has received an upgrade. The same great features of the old formula have been improved. The new chemical compound now allows for a stronger bond on the molecular level giving coated materials a stronger resistance to corrosion and improved rigidity. The new formula also has a significantly faster curing time, under 2 hours. Check out some of the benefits and suggested uses for the coating below. For more information visit the “Protective Coating” tab on our web site or contact us for technical data. Back to work for the first week of the new year we came across a job that we don’t see every day but is fairly common nonetheless. 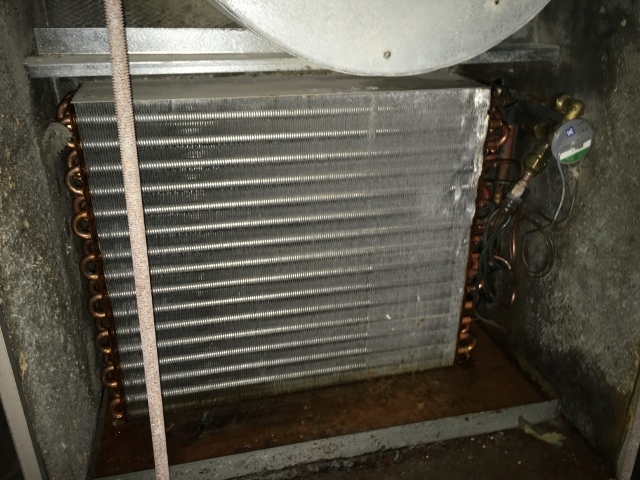 One of our team members was called out to take a look at a couple of evaporator coils that were cooling three separate wine cellars. Three cellars that were chilling hundreds of thousands of dollars of wine! The units used to chill the cellars were not all that old but the coils were beginning to fail due to the high level of stress they are put through. See, these coils don’t have a 9-5 job, they are working 24/7 – 365 to make sure the cellars stay at a constant temperature. The long work hours combined with the harsh environment lead these coils to deteriorate much faster than your typical application. 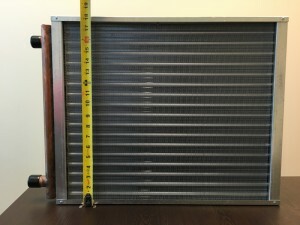 We were able to provide the customer with a quick quote that will save them thousands over replacing the entire unit. 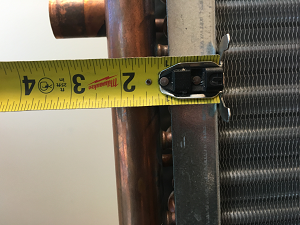 Here is a short guide on the basics of measuring a coil for replacement. This is broken down in to four simple stages: Tubes, Fins, Casing, and Connection. The first step is to determine the outside diameter of the tubes i.e. 3/8″, 1/2″, 5/8″. This can be done by using a caliper or a tape measure. Next we need to determine how many rows deep the coil is. 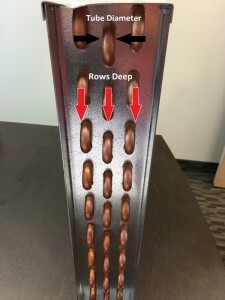 This is determined by counting the number of rows of tubes through the depth of the coil. The example below would be three rows deep. To determine the face area of the coil we need to measure the height and length of the fin pack. This measurement should be taken on the inside of the casing flanges. Next we need to measure the number of fins per inch. 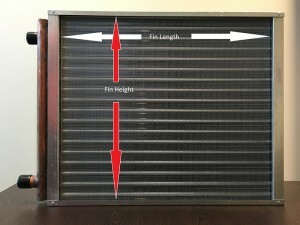 This can be done by laying a tape measure horizontally against the face of the fins and counting the number of fins within one inch. Measure the height, length, and depth of all casing. Make sure to measure the top/bottom and side flanges. The next step is to measure the outside diameter of any headers and connections and their locations. 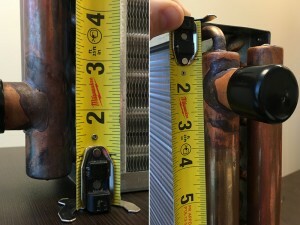 Measure the top connection from the top of the coil to the tube center of the connection tube. 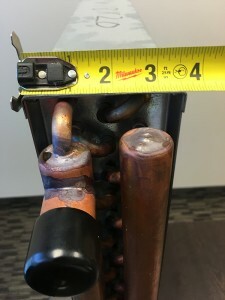 Measure the bottom connection from the bottom of the coil to the tube center of the connection tube. Finally we want to measure how far the headers and connections extend out from the face of the coil. We hope this short guide to coil measuring basics helps with your next coil measurement. 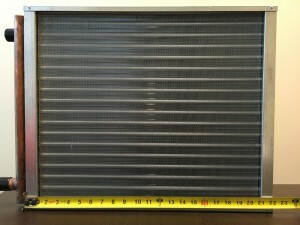 We recommend using one of our blank coil drawings to keep track of all of your measurements. They can be found on each of our coil pages. If you have any questions or would like additional help please call one of our team members at 866-320-9050. Temperatures are dropping, are you prepared? With the weather changing and temperatures across the country plummeting, your coils are at risk! 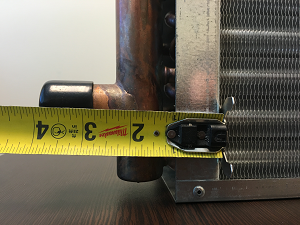 When the temperature drops below freezing your coils are at a higher risk of freezing and eventually bursting. Freezing water in the capillary tubes will expand causing the tubes to rupture. 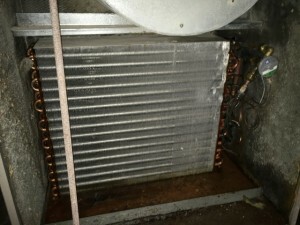 Once this occurs your coil is no good and needs to be replaced.